Pumpkin spice coffee. Pumpkin spice lotion. Pumpkin spice candles, soaps, foods - well, the list goes on and on. Another endless list? The competition and hustle of the millions of product companies, businesses and marketers trying to find another way to ‘win’ this season by competing with or leveraging with the hype of Starbucks Pumpkin Spice Latte. 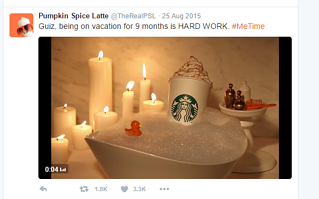 What in the world do 'Pumpkin Spice Lattes' have to do with events? When it comes to event marketers and the events that they are planning, this age old saying may have a bit of “but” to it. Yes, no press is in no way helpful when you are marketing your events, however negative press for a smaller or first time event can also be traumatic. That is exactly why it is essential for event marketers and event professionals to engage their audience, and begin the story telling of their event far prior than to just at the event. Getting the hype out there – helps generate pre-event engagement, as well as potentially attracting a larger audience eager to attend your next event. Key Point: No one knows an events voice, message and purpose better than those putting on the event – the event professionals and event marketers (well, and perhaps the mobile event app company you’re working with): get your message out there! 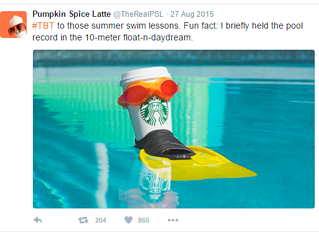 It was announced that the “PSL” – the pumpkin spice latte would officially return to Starbucks on September 6, 2016 – unless you were a ‘rewards member’ and then you could get it before everyone else on September 1, 2016. Those two days showed massive spikes in the initial interest and trend of everyone’s fall favorite – pumpkin spice. What is even more important, however, is that even after the initial announcement, while the immediate hype was increasingly high, the ‘viralness’ has continued without drastically dropping. As the season continues, it is predictable that the hype and search for pumpkin spice will continue. Once event professionals formally announce the dates of their event it is important to continue to leverage the original hype and excitement of potential event attendees. No, #eventprofs, you don’t have to take last year’s mobile event app and wrap it up in fuzzy hearts for valentine’s day, or showcase it on a flipper in the pool. However, for events that occur more than once, it is important to continue to engage and monitor with your event and event attendees. What if it’s a one-time event? Even if your event is a one-time event, it is important to at least provide some sort of post-event engagement follow up. Ask questions to your event attendees – what did they like about the event? What did they change? Utilize your mobile event app reporting and event app survey features. After the event is over, provide follow up opportunities, send a thank you, and provide potential ways for event attendees to re-engage with fellow event attendees after the event, as well as view presentations, etc. Key Point: Whether your event is multiple times a year, once a year, or a one-time event – leveraging post event engagement is important. Don’t just walk away. Event attendees will appreciate the opportunity to have their voices heard, and engage with potential future events. Pumpkin spice lattes can teach event professionals and meeting planners a lot. Promote your message early, engage with your event attendees, and leverage your initial and post event hype. MeetingPlay provides mobile event apps that help event professionals market, engage and excite their event attendees in every stage of event planning and execution – before, during and after. Learn more about MeetingPlay’s live event engagement technology solutions with a free demo!